At the second annual "Afternoon at LaunchLabs" event, students engaged with female entrepreneurs at the state-of-the-art Alexandria Center for Life Sciences.The 25 student participants were divided into small groups to meet entrepreneurs and learn about their backgrounds and how they got to where they are today. The girls asked interesting questions before they were taken on a short tour of the laboratory by the LaunchLabs team, and the afternoon concluded with a science-themed reception! 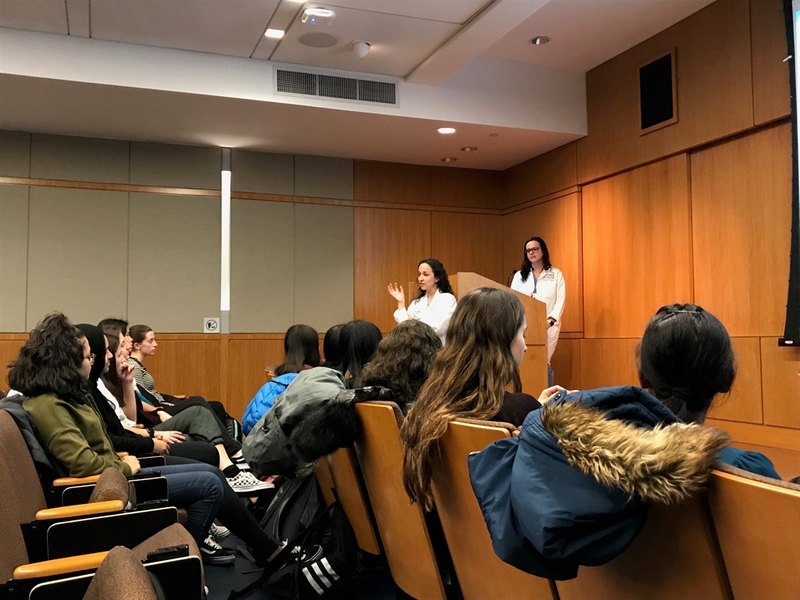 On Thursday March 7th, in celebration of National Women's Day, WIB-Metro New York hosted a panel event titled "From the Bench to the Boardroom" at NYU Leslie Labs. 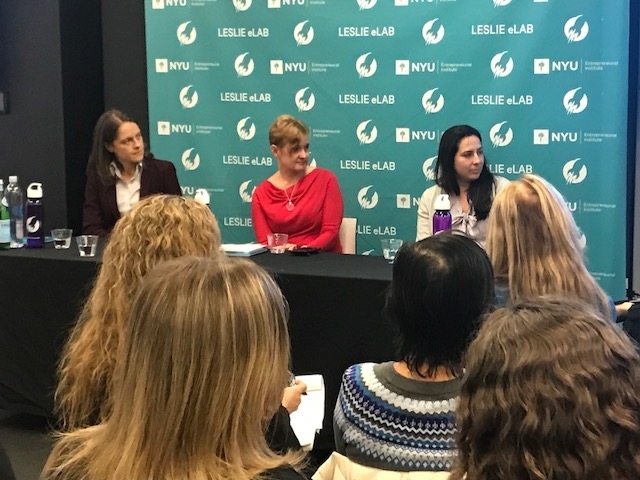 Dee Dao, PhD, from the NYU lnnovation Venture Fund, moderated the panel of three successful entrepreneurs: Sofija Jovic, PhD, MBA, co-founder, Prophase; Maria Luisa Pineda, PhD, CEO, Envisagenics; and Erika Smith, MBA, CEO, ReNetx Bio. The panelists candidly expressed their journeys as they navigated company creation, management, and exit. The packed room had a chance to engage the panel in thoughtful questions, and gain their insights into the opportunities and challenges we all face as both "entre-preneurs and “intra-preneuers." Erika emphasized how running a start up is like sailing a ship - you need to “tack in the direction” the winds take you, and not fight against forces you cannot control. Maria shared how limited the typical representation of entrepreneurship can be, as many of us have alternative projects, revenue streams, or plans - all in addition to day jobs that we might call "work." Last, Sofija shared how sobering it was to realize that, as a CEO, it was her job to make the final decision, "not waste a crisis" and provide direction for her team as they navigated the highs and lows of a start-up company. The Robotics in Surgery Demo at NYU Langone on February 13, 2019 was full of great vibes and robust discussion for 25 NYC high school students. Dr. Amie Kent is speaking (left) and Irina Komm is at the podium. Dr. Amie Kent, a cardiothoracic surgeon who is certified in robotic surgery, explained how robots are transforming certain kinds of lung surgery due to their ability to enable smaller incisions, which are necessary for minimally invasive surgery. As a result, patients recover faster and get out of the hospital sooner than they do with traditional open procedures. She also talked about her career decisions and how she has successfully balanced her intensive training and personal/ family life, assuring the girls that she has a spouse, child, and friendships outside of work. PA Irina Komm discussed different kinds of careers open to women interested in robotic surgery. Komm, Kent, and Melissa Figueroa, also on staff at NYU Langone then organized a hands-on, interactive demo of the DaVinci Robot that is used in cardiothoracic surgery. YWIB Metro New York and NYU Langone have been running this hugely popular program for several years now. Recruiting and school contacts were organized by volunteers Neda Memar (photography credits), the YWIB program lead, and Wendy Diller, YWIB Metro New York Chair. There are great careers ahead for the 25 student attendees!